The first effort of the citizens of Fergus Falls (township 133, range 43) to Organize a civil township was made June 29, 1870. The petition for the organization of Fergus Falls township carried the names of the following legal voters residing here at the time: Ernest Buse, Henry Oppermann, Gustav Kalling, Henry Hanigson, Carl Haarstick (? ), August Westberg, Peter Johnson, Lars Johnson, Johannes Petterson, Mathias J. Halden, Erik Nilson, C. H. Westberg, R. Kalling, J. Kalling, Mathias Syverson, Frederick _______, Iver Skistad, Mathias Halverson, Nels Johannson, Theodore M. Ulvigen, Henrik Burgdorf, T. Marks, C. Kosbau, T. C. Kosbau and Peter Sims. The first election was held at the house of Ernest Buse on July 15, 1870. T. Upham, N. P. Clark, Calvin F. How, Sewell A. Wolcott, Chester Wail, Henry Cook and Lewis J. Brown. This was the eighth township organized in the county. It is bounded on the north by Elizabeth, on the west by Carlisle, on the south by Buse and on the east by Aurdal. There are thirteen lakes of considerable size in this township. Wedel and Oppermann are the largest, with Lake Alice and the others ranging down to a few acres. Red and Pelican rivers flow through this township and furnish excellent natural and artificial drainage for this section. The Red river also affords water power for the mills which are located along its banks. The Red river enters the township in the east central part of section 36, then takes a westward course and leaves it in section 34, meandering into section 31, then returning to section 32, where it leaves the township, flowing due south. Pelican river enters the township on the line between sections 4 and 5. It then flows across the northern por tion of the township, entering Carlisle township from the southwest corner of section 18, only to return again in the southwest corner of 30, and empty ing into Red river, where the latter makes the bend into section 31. The maximum elevation of this township is in the northeastern part and rises to a point thirteen hundred fifty feet above sea level, while the minimum eleva tion of eleven hundred fifty feet is in the southwestern part, where the Red river leaves the township; The average elevation in the northwest central part ranges around twelve hundred fifty feet to thirteen hundred feet. There is much broken land in this section but, as a whole, it is excellent farming land. Fergus Falls is the only town that has been platted in this township, and it will be taken up in another chapter. 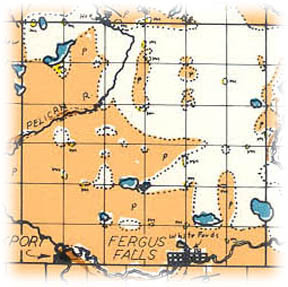 Most of the history of the township is concerned with the city of Fergus Falls. The present township officers are as follow: Supervisors, H. Steinbach, E. Peterson and L. Tomhave; clerk, J. F. Tomhave; treasurer, William Haarstick; assessor, William Schoening; justices, William Schoening and Max Kronemann; constables, G. A. Tomhave and Albert Schmidt. Places of birth for Fergus Falls Township in the 1905 state census.